Exactly on my 40th birthday I started to realize my big dream, which I was thinking about almost all my life – I had wanted to see one of the biggest world metropolis – Tokyo. The way to Japan was really long. Flight from Europe to last 11 hours but preparations to my journey had been taking me much more time – weeks. I have heard that moving around Japan in that equipment for disabled which I have (this is one hundred and fifty kilograms electric wheelchair) it will be really hard. I was scared that I won’t able to use trains here. But I planned to use only public transport in Japan because of cheapest price. So my feelings were mixed and I were looking a lot of information about adaptation for disabled people in public transport. To find adapted room in Tokyo, in good price and close to underground was really hard. I had to pay a little more money for bigger apartment. Small, tiny rooms and completely not accessible for disabled people and big electric wheelchair – is normal in Japan and it was problematic for me. 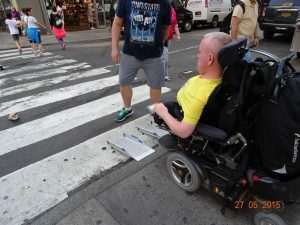 It is worth to ask, when you booking your hotel, if room is adapted for disabled and to what extent. A lot of hotels don’t have any possibility to accommodate guests on electric wheelchairs. When I were looking for information about availability for disabled in Japan I found two useful websites: http://www.japan-accessible.com and https://www.accessible-japan.com. And I found out knowledge about underground and trains on this websites. There are a lot of essential and important information for disabled people and about tourist attraction adaptation too. Moreover I used Google maps as usual. First of all, I were watching a lot of videos about Japan on YouTube. I found one Japanese girl who is moving on wheelchair and she makes similar videos to my. A lot of vlogs on the Internet are in Japanese but I was able to get the most important information for me. I start to contact with this girl but we didn’t meet face-to-face because we couldn’t find good dates. My visit in Japan was really short. Everything is prepared – set, go! At the airport everything was fluently. I was on my wheelchair really quickly, the service was efficient. I had visa in my passport truly fast and… and we stayed there alone among Japanese subtitles and misunderstood conversations which we heard. Strangely enough, in first train, called SkyLiner everything was easy and after fifty minutes we were in Tokyo on Ueno Station. And here was harder. It was huge place and problem was getting to the underground. Corridors and tunnels make some kind of net and there were stairs! Before journey I had checked information about this station and everything was OK – platforms and trains adapted and comfortable for disabled. I asked staff for help and they started to explain me in English and in Japanese. They gave me maps of this huge and multilevel Ueno Station. Everything was confirmed – my underground line have a lift. But how can I get here if I have the stairs in tunnel? We were looking for answer almost two hour. Answer was very easy – I had to go out, went to the other side of street and take the lift to the subway platform. Easy? I had a lot of situation like that. I can write them down but I would have to write the entire book. I want to inform that in Japan you must have eyes in the back of your head if you want to find lifts. 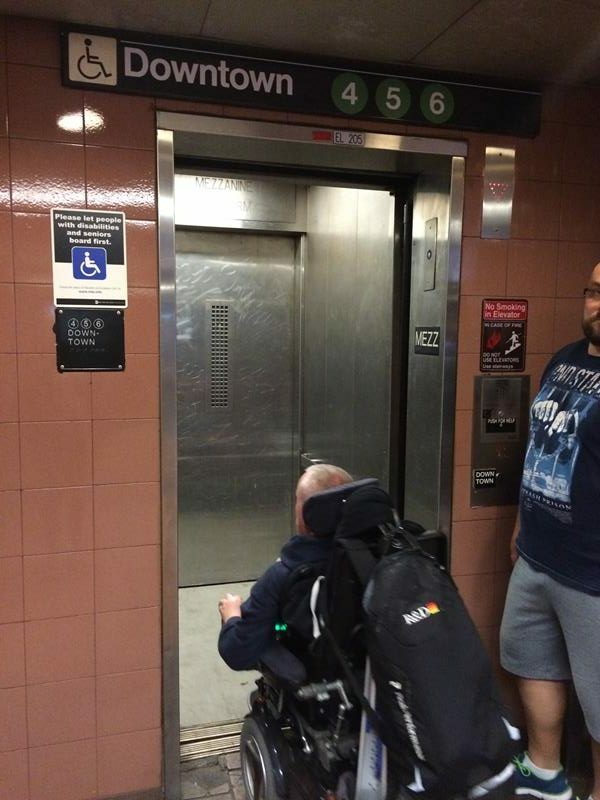 Usually, if somewhere was subtitle that this station is available for disabled it was true. But sometimes lifts were hidden for example in shopping mall. We had to looking for a lot of entrances and exits. But we were better and faster with every day. And after few days we know a lot of stations haven’t got any secrets for us and moving in underground was easier and easier. 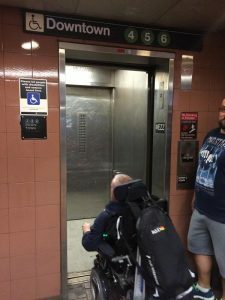 It’s really important – on many stations I couldn’t drive to the train without small ramp. I could defeat gap between the train and the platform. You can ask metro service about ramps and they give you one. And now we come to the final point of travelling in Japan. When you enter to the underground, you must ask staff for help immediately and tell them where is your last point (even if you have changeover you must tell them where you’re going). Why? Japanese people are really careful, strict and responsible and I think that I will tell you about this many time. Staff guide disabled person carefully to train. And in the next station there was person with small ramp who guided me to succeeding train (if it was change) or to good exit when we told where we wanted to go. The same situations are where you travel by train, tram or ferry because I travelled by this kinds of transport. Summarizing, staff in Japan is really great and they conscientiously perform their duties. There is sometimes only one problem – language barrier. Very few people can talk in English. A lot of beautiful and interesting places weren’t available; there are a lot of stairs. I doesn’t mean that I didn’t see anything amazing. I saw a lot of beautiful places. In Tokyo the most comfortable restaurants are in shopping malls and in multi-storey buildings with lifts where on every floor is another bar. Otherwise, restaurants next to the main streets mostly are available for disabled – in contrast of those in small streets and alleys. From the economical point of view the best shops in Tokyo are 7eleven – there are sometimes small and tiny. You can buy there prepared food. And there are microwaves so you can warm up your food. I sincerely recommend, I used to bought food in this shops and a lot of products are really tasty. Comparing this kind of food in Europe, this one was aesthetic. This meals look great and taste is good. Now I can tell you something about toilets. In Tokyo they are really clean and high-quality – I haven’t met better toilets in any city in Europe or in the USA. Personally, I used that one on stations, gas stations and in shopping malls – of course, the last ones are dozens in Tokyo. Every time in that places were special, bigger and really good equipped for disabled people. Normally there was heated toilet seat, toilets with a lot of functions (washing, drying and music). Control panel is done really big impression. Toilets are very clean with few sinks, disinfectants and small bed if somebody need changing clothes. Against the background of other big cities like Paris, Rome or New York where I had to looking for special toilets – Tokyo is perfect. Summarizing, you don’t need to be afraid of availability for disabled people in Japan. In only few words – Japanese people are very cultural, reliable and introverted. Streets are clean and safety. You can leave your bags everywhere you want and I think that nobody steals your stuffs. Japanese respect everything what is surrounding them. You can see this feature for example on their money – these is like from printing house. They have their bank notes straight in wallets and I didn’t see anyone who had money in pockets. If you ask them for help they are always agree. Unfortunately, I noticed a reluctance to making eye contact. When I were looking for someone no one didn’t smile to me. They respect privacy and they don’t interact with other people on street. Personally, I felt like they are afraid of me. In Japan disability is sometimes still considered as a disgrace in the family – this is sad. But I know that everything is changing quickly and they do a lot of things for disabled – this is a great hope. Summarizing, Japan you can visit in wheelchair and you haven’t afraid of anything.